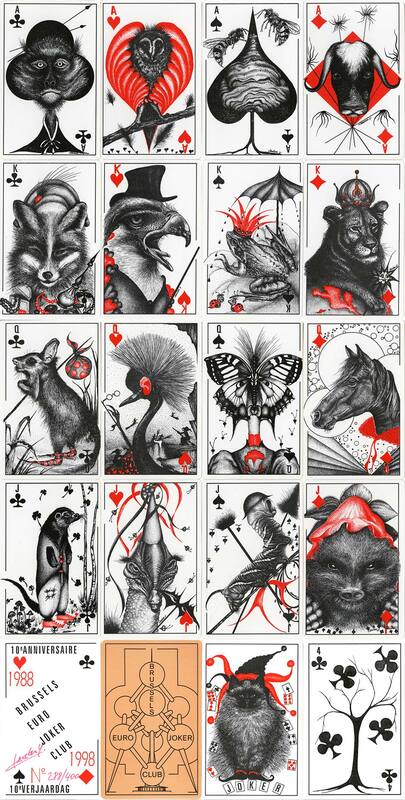 Brussels Euro Joker Club's exciting 10th Anniversary deck, with artwork by Yvette Cleuter, was produced in a limited, signed and numbered edition of 400 copies. The beautiful and intricate artwork was done in pencil and includes animals with human characteristics, sometimes endearing. The Brussels Euro Joker Club was founded in 1988 but sadly had its last meeting in November 2011. 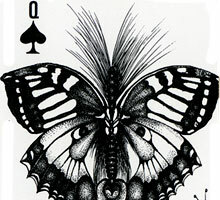 Above: 10th Anniversary deck for 1998 with artwork by Yvette Cleuter, whose signature appears on the title card and also can be seen on the cards themselves. Limited and numbered edition of 400 copies. 52 cards + 1 numbered and signed card, 2 jokers, 1 extra joker and 2 blank cards. Images courtesy Barney Townshend.